I cant remember exactly when it was, but it must have been more than a decade ago when there were rumors of a new invention, soon to be revealed, which would radically tranform the way we all lived. When I finally DID find out what this contraption was, a silly sort of battery-powered scooter upon which the rider stands upright, I could not help but feel GREATLY LET DOWN ( and I guess that MOST people felt the same way), and in all the years since I had only seen this environmentally friendly machine ONCE- at Narita Airport being ridden by a patrolling security guard. Once, until TODAY, when I saw three or four SEGWAY Human Transporters ( as these vehicles have been dubbed), which have been lent by Segue Japan to Tsukuba City for a special event focusing on CLEAN ENERGY! That means that YOU, or anyone else with the gumption to try riding one of these crazy machines ( as you have probably heard the man who had bought the company from its original owner died after falling off a cliff while riding his Segway), can give it a try- completely free of charge! To assist you in getting the hang of it, several Tsukuba university students, who have been trained by the Segue company, will be there, as instructors. You will be able to take advantage of this opportunity through February 16th, from 10AM to 4 PM- at the building in the middle of the pond, just across from Tsukuba`s Expo Center. While there, you can also try riding a battery powered bicycle. While waiting for your turn you can soak your feet in the warmth of a solar- powered foot bath. I gave the Segue a try myself, and I must say that I enjoyed it alot. It IS quite amazing! You can learn the basics in a couple of minutes and then can guide the scooter with the merest shifting of your weight. It will not revolutionize society, but it sure is fun. 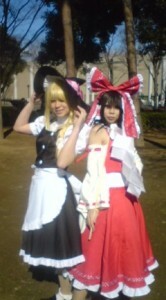 Those of you who tried the Segue today (Feb. 13th 2011), or were just enjoying a stroll through Tsukuba`s Central Park, were in for an EXTRA treat- The Cosplay Festival- which was held a mere 100 meters away from the Green Living Event! Dozens of young men and women ( and some not so very young) were dressed up as their favorite ANIME or game characters! What did they do? Well, nothing much- just alot of preening and posing before the cameras. Yes, there were plenty of eager photographers ( professional, or at least with professional looking equipment!) shooting away. It seemed as if some were even paying money for the Cosplayers to pose. I found out the hard way that you had better ask for permission before taking pictures at such events. As I was taking a couple of candid shots ( with my cell phone), three girls came over to scold me for my poor manners. Then again, by being so authoritarian they might have just been getting into their characters- they were dressed as Nazis! It was all quite bizzarre! A conversation that I overheard between a 40- ish Japanese couple sums it up. Shocked by the scene of so many photographers snapping away at the Cosplayers, the wife disapporvingly said- Why are they paying them so much attention? Why are they taking pictures? Her husband cooly responded: Its……. CULTURE. And what brings all this culture to Tsukuba? The Tsukuba Express! Yes, train-lines, like rivers of old, are conduits of culture- and now brainy, bookish conservative Tsukuba is linked directly to Akihabara- the OTAKU Capital of Japan! TX has brought the commuters, the Mt.Tsukuba Day-Hikers, and now the Cos-players! That transporter is very strange as a human-transporting machine, I agree with Avi-san . It looks like it would be much easier to use 3 or 4 wheels-battery-powered vehicles like those which already are used by the elderly in Japan. But now I can understand from this article there is an appropriate area for using this funny transporter. In a wide open crowded area like an airport, for those like security-persons or the like to patrol it might be suitable, because it could give its rider a higher view, even higher than the mounted police! Without dung-dropping or exhaust gas, it is very clean and much to maintain!! For this purpose I recommend standing place of this vehicle should at least 30cm high. Then one can get a distant view like Giant or someone on stilts. With a showy dress like cos-play. My interest turns toward much more towards the “ Robot suit ”HAL” which assists human movement of the arms, hands, legs by using a motor with a very sophisticated mechanism. 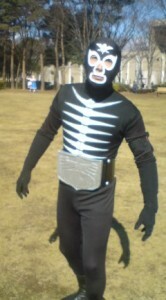 They say a show about this one will be held near Kenkyu-Gakuen station 16th Feb.
Cos-Play-Festival! Near Akihabara-Station, dancing or stop-walking have been prohibited after recovery of Hokosya-Tenngoku (Heaven for pedestrians) as an effect of that awful indiscriminate killing two years ago. So those Cos-Players and people who want to take photographs in Tsukuba might be refugees? For them Tsukuba center should be very attractive place! It is wide open and clean,can dance or sing also there they can expect many queer spectators (like researchers) who like queer or originally invented things.Otakus too. I agreed it is Japanese culture to put on costume quite different of one’s being like Kabuki-Players,Takarazuka-Girls,New-Half-Dancers,Berusaiyu-no-bara-players(Famous comic for girls, Rose in Versailles palace), even the Samurai warrior wore very gorgeous colorful clothes and armors to compare everyday life. Japanese have not needed to be caring about religious authorities when they put on clothes not like people of Judaism, Christianity, Islam, or Communism, except during WWⅡ. It could be thought somehow symbol of free expression of oneself and peace Japan enjoyed recent 65 years beside violent demonstration of 1960s. Some young people don’t know Nazis nor such the fact Japan fought ABCD countries during WWⅡ. They don’t mind other than their own environment which effect directly. But they can get information easy if they want, this is very important aspect in East Asia. Mamoru-San, I agree with you very much about DRESSING UP in Japan. If one could say that there is one or more particular GENIUS to a particualr people or culture, maybe overall, looking at its entire history. I guess we could say that FASHION and dressing up have always been one of Japan most brilliant features. When I first started reading Japanese classical texts, The Tale of Genji ( Genji Monogatari) for example, one thing that really stood out for me, was the constant and detailed reference to what each character was wearing. and just look at how many Japanese are among the most successful fashion designers in the world! In the case of Cos-Play, we surely have an interesting cultural, sociological, or even ANTHRPOLOGICAL phenomenon! In a country where finding your own GROUP can be very important, we can see more and more people finding place and comfort by BECOMING ANIME CHARACTERS! I guess this can sometimes be easier than being ONESELF. To tell the truth, growing up in New York, I might have witnessed the true birth of Cos-Play. Back in the 1980`s there was a movie, which had not been successful during its first run but which became hugely popular, a so-called cult-movie, as a regular MIDNIGHT FEATURE which played at certain theaters. The film is called the Rocky Horror Picture Show ( you can rent it in Tsukuba). Near my family`s apartment in The Village, was a theater which was probably the most famous place to see the show. characters ( or the ones which they could resemble most). Then as the movie played, some of the cos-players would actually stand up in front of the screen and perform along with the movie- moving with the on screen characters motion by motion! And getting back to freedom in fashion. I agree with you, that NOW Japan is one of the FREE-EST places that the earth has ever known. In past ages, howeverm dress was extremely restricted. One reason why you can find just as many refrences to WEAR in The Heike Monogatari, a tale of war, as in the Tale of Genji, is the fact that certain colors and style were worn by persons of specific ranks. There had always been restriction on color, material, and design, which related to the very detailed system of social ranking which existed in Japan. During the Tokugawa Period the austerity orders restricted the populance from wearing SHOWY ( HADE, 派手) clothes. That is why YUUKI TSUMUGI, the famous type of textile produced in Ibaraki Prefecture`s Yuki City is so famously subdued ( JIMI). I agree Avi-san that Japanese have been so called group-oriented, it was said Japanese people were relay depended on cultivation-agriculture especially Rice-production using water. To use water there need much cooperation with other people of using same water resource. They were not like people of nomadic nor animal husbandry-agriculture life where they rely mostly on themselves. Those people were more dependant or accustomed individual-decision making. I have learned so and think so now. This aspect is not so simple like you wrote but easily understand the difference. Tokugawa-Era Tokugawa Government sometime forbid to wear certain gaudy clothes because when people became rich(especially merchant class) and had worn such gaudy clothes then government prohibited to consider feeling of peasant who had spent subdued life, even their official class-rank were higher to compare merchant class. Also it was warning to Samurai-class mostly their Domain had been near Bankruptcy. A few Japanese people were tending to wear gaudy clothes if they can afford. So modest person like Ryoukan-san, load Uesugi-Yozan,Ninomiya-Sontoku have been intentionally praised. I remind famous singer Kobayashi-Sachiko’s clothes in Kohaku-Utagassens especially at 31/Dec. last year. I could not close my mouse even I forced to close. 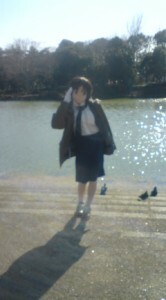 To compare her gaudiness Marilyn Monroe in “Gentlemen like Blonde” or Cos-play girls in Akihabara were nothing!? I saw the SEGUE Human Transformer on TV and a TV reporter trying it out. I wouldn’t ride it near a cliff! It’s insane! Yeah, nowadays those dress-up youngsters in Harajuku doesn’t like their photos being taken. This ‘culture’ has also spread to other countries like Malaysia. Hi Alice! Could you tell us more about Cos-Play in Malaysia? Do those into it dress as Japanese ANIME characters? Im very interested. Riding the segue was easier than I expected and also very fun. The staff told me that in Japan there is no permission for people to ride segue on roads or sidewalks. 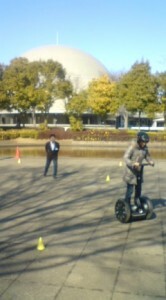 If there is permission by law in the future, maybe many people will use segue in Tsukuba. The pedestrian walkingway woulld be a convenient place to ride segues. 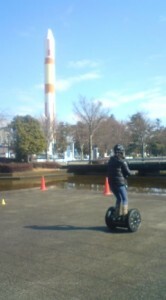 I also experienced riding the Segway. At first it was scary but I enjoyed very much and was able to go fast and get used to the speed. I thought that it is also quite good fun in addition to being eco. I was sorry we could not see the costumes.